Similar to the British "Pop Idol" or the German "Deutschland sucht den Superstar" and their many spinoffs, "Kokhav Nolad" (A Star Is Born) is a popular casting show which searches for the most talented young singers in Israel. Starting in 2003 the program has been broadcast on the Israeli Channel 2. With a big finale "Kokhav Nolad 5" recently finished in Golan beach in Tiberias. 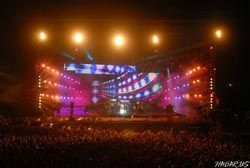 For this show the lighting designer Ronen Nagar, stage designer Maya Hanoch and video designer Merlin Group trusted in MA Lighting technology. By using two grandMA full-size, two grandMA video media servers, an MA NSP and an MA 2Port Node they created an extraordinary event. Their goal was to synchronise lighting and video: a task were the MA system is second to none. A.B. Electronics LTD delivered the lighting equipment. Screenlight and Zilberboim participated in the realisation. Keshet Productions was the customer.